In just six short weeks, we crafted an idea and turned it into a reality. In early November, we embarked on a mission to provide more new tools to help HootSuite users manage more social media activities and networks through a new API. Last week, HootSuite announced integrations with the popular Salesforce Chatter & Lead Scoring apps which will be included in the forthcoming App Directory. 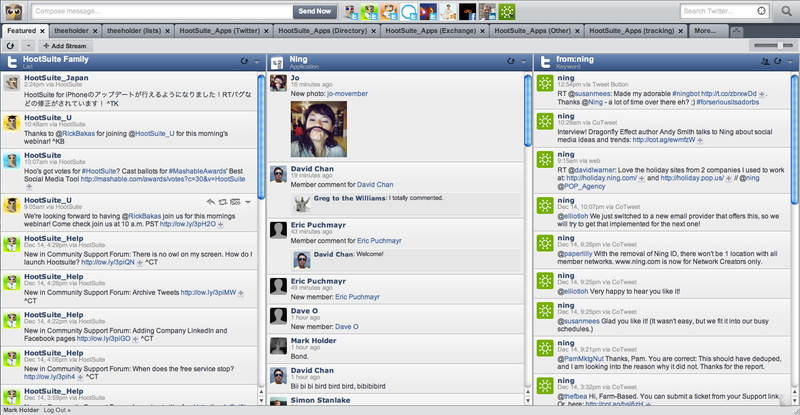 Today, we are excited to share the latest addition to the HootSuite nest: Ning. We worked closely with the engineers at the popular social network platform to develop using our API, and our collaboration has allowed us to release Ning into the dashboard just in time for the holidays! Ning is the leading online platform for the world’s organizers, activists and influencers to create social experiences that inspire action. For brands and organizations of all shapes and sizes, Ning span categories like politics, entertainment, small business, non-profits, education and more. With Ning, you have the ability to engage your most passionate customers by creating social websites where you can create and manage direct relationships, encourage feedback and sharing, and turn your most valued customers into brand evangelists. With this integration, the 1 million HootSuite users can now broadcast to Ning’s participants – which number upwards of 70 million users across 80,000 social websites – and connect with them about the topics they are passionate about. So, get social with Ning today! Once you sign up for a Ning account, simply add it to your HootSuite dashboard, and you’re ready to start posting messages, monitor conversations, plus view profiles and images in-dash and more… in much the same way you do with your other social services. Now, all HootSuite users can add Ning to their dashboard free of charge for 30 days as a preview of what’s to come as we continue in the development of the forthcoming HootSuite App Directory. You can also enjoy a 30 day free trial of Ning to see how these tools can work wonders together. We surprised ourselves by releasing Ning much earlier than anticipated as the directory is still in development. Stay tuned to the blog for more app details leading up to launch early 2011. If you have an idea for an app to add to the HootSuite dashboard, share it with us in the Community Feedback Forum. For early launch consideration, developers can apply for API Access plus follow @HootSuite_Apps to Q&A. For more info about HootSuite, please visit the online media kit where you’ll find logos, contact information and additional resources. To learn more about Ning, please visit about.ning.com.